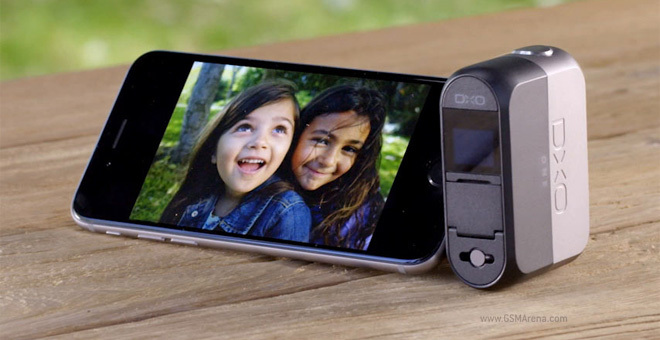 The DxO ONE uses a physical connection to the iPhone or iPad, over the Lightning port, which eliminates lag compared to the wireless connection of Sony’s QX cameras. The sensor is a 3:2 CMOS BSI unit while the aperture goes between f/1.8 and f/11. You can adjust ISO between 100 and 51,200 and the shutter speed between 1/8,000s and 15s. Supported formats include JPG, DNG and DXO (SuperRAW). For videos, the DxO ONE shots MOVs at up to 1080p @ 30fps. You can do slow motion at 720p @ 120fps. A dedicated app handles all the controls on-screen, with DSLR-like manual controls. The SuperRAW format shoots four RAW images and uses software processing to push image quality to DSLR-levels… according to DxO’s own reviews anyway. The ONE can rotate 60° up and down, a tilting screen of sorts. There’s a two-stage shutter button on the device itself and a small OLED status display. Since the Lightning port is reversible, you can flip the ONE around and shoot the best selfies in your life. A microSD card slot helps you store those large RAW files without wasting storage on your iPhone or iPad. The battery is good for around 200 photos. The whole camera weighs 108g and measures 67.5 x 48.9 x 26.3mm. It’s compatible with every iPhone or iPad with a Lightning port running iOS 8 or later. There’s no iPod touch support though. The DxO one has a few weaknesses – it lacks optical stabilization or zoom, only offering digital ones and there’s no flash either. The biggest issue is the price, though. You can grab one for $600 in September, &euro650 in Europe. Pre-orders are available in the US only. For a limited time you get only also get DxO OpticsPro and DxO FilmPack software for free (which amount to $330). To put this in perspective, a Sony QX1 lens camera has a bigger sensor (APS-C), removable lens, the kit lens has zoom (16-50mm) and a built in flash and is €450, available right now.